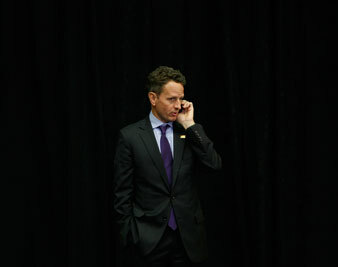 Timothy Geithner talks on his cell phone during President Obama’s news conference at the conclusion of the G-20 in Pittsburgh. Wonderful. The thirteen Democrats on the Senate Finance Committee get one faintly rational Republican to join them in a meaningless stab at healthcare reform and it throws the media into a titillated frenzy about what it all means. It means very little. The healthcare debate has become a convenient distraction, for both political parties, from the far more pressing issues surrounding the banking meltdown. As important as health insurance is as an issue, representing 16 percent of the economy, and with so many uninsured, no sane person can deny that the current system is a sorry mess that needs to be changed. But why now and not after a growth economy has returned? The answer is that politicians from both parties just love the healthcare game because it allows them to assume reflexive but irrelevant postures in that tired old debate about “socialized medicine” versus “free-market choice” although it has nothing to do with either ideological fantasy. Consumers do not have meaningful choices as it is–many have no coverage and others are frozen into some company-sponsored plan–and it is insulting to the social democracies of Western Europe to suggest that anything comparable is even under consideration in the U.S. Congress. The healthcare issue should never even have been brought up at a time when the economy is reeling and we are running such immense deficits to shore up the banks. Instead of fixing the economy by saving Americans’ homes and jobs, we are preoccupied with pie-in-the-sky rhetoric on a hot issue that should have been addressed in calmer times. It came up now because, despite all the hoary partisan posturing, it is a safer subject than the more pressing issue of what to do with Citigroup, AIG and General Motors, which the taxpayers happen to own but do not control. While Treasury Secretary Timothy Geithner plots in secret with the top bankers who got us into this mess, we are focused on the perennial circus of so-called healthcare reform. There is an odd disconnect between the furious public debate over healthcare reform, with its emphasis on the cost of an increased government role, and the nonexistent discussion about the far more expensive and largely secretive government program to bail out Wall Street. Why the agitation over the government spending $83 billion a year on healthcare when at least twenty times that amount has been thrown at the creators of the ongoing financial crisis without any serious public accountability? On Wednesday, the Wall Street Journal reported that employees of the financial industry that we taxpayers saved are slated to be paid a record $140 billion this year. If you want to know who actually runs this country, just look at the phone logs, released by court order last week, revealing Geithner’s nearly constant calls to solicit the advice of the fat cats who caused the banking implosion. It’s the same as when he was chair of the Federal Reserve in New York, before Obama appointed him to his current job. Only back then, as he blithely ignored the impending financial meltdown, it was easier to have lunch with the bankers as well as to chat by phone. Nothing has changed since then. Meanwhile, we all get in a tizzy about fake efforts at health reform as immense decisions are being made to ensure the health of financial institutions that should have been left to die.